Not long ago, I acquired a rake of 1980’s-era gauge 1 Tenmille Maunsell coaches. 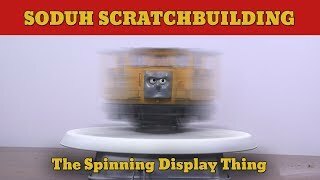 In addition to an ongoing (if mostly sporadic) attempt to make vaccuformed duplicates, I’ve taken to documenting the variations of this exact coach used on the show throughout the years. 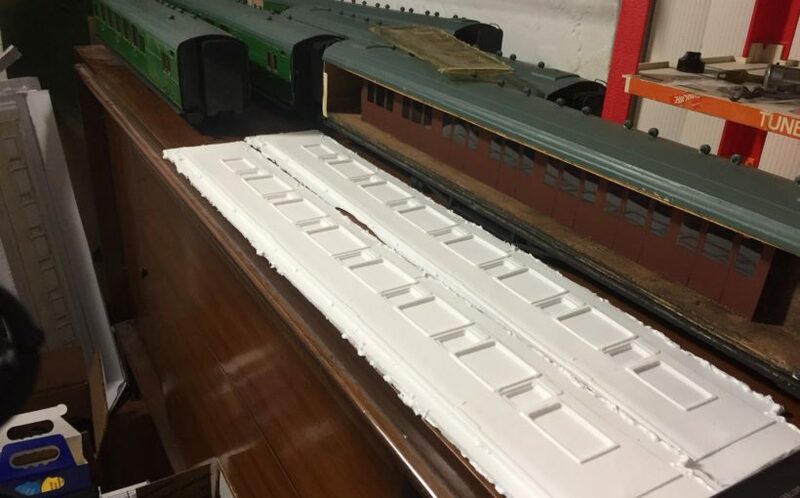 The original coaches used in 1984’s Series 1 were shortened down from their prototype length; most likely to fit a greater number of coaches on the same sized set with no great need for excess runoff track, and to fit through tight turnouts. 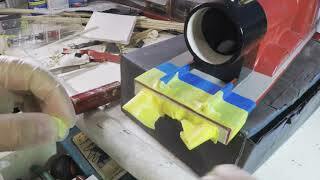 The end result resembles Lionel’s “selective compression” of prototype rolling stock designs. 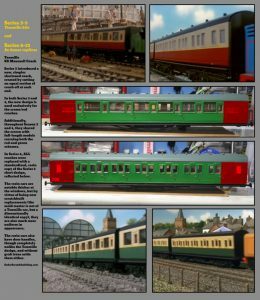 Unlike any coaches to come after them, the Series 1 coaches were sectioned from the middle – not equally on each side either – achieving a shortened body while maintaining the stepped corridor windows of the Maunsell prototype of which they’re based. Note that the Maunsell coaches used for Tenmille’s prototypes have unevenly spaced passenger compartments and thus unequal length windows. These are prototype features and not errors. 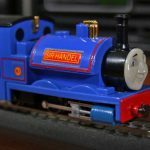 The Series 1 coaches also did away with the Tenmille Maunsell bogie in favor of the more compact Tenmille AG115, a generic bogie marketed by Tenmille as suitable for both standard and narrow gauge. These bogies are three-piece plastic designs with a crossbar fitted to the top holding the two sideframes together. The Series 1 cars substitute the original crossbar – which would have sit flush with the top of the sideframe – with a thicker wood spacer. 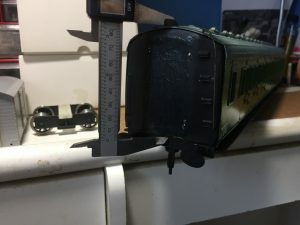 This raised the coach enough to allow the bogies to pivot without causing wheel flanges to bind on the bottom of the coach – a particular issue when negotiating tight Marklin curves. Series 1 coaches were also fitted with some of the supplied Tenmille interior detail, seen briefly in the Series 2 episode, Wrong Road. The delicacy of the vaccuformed car sides can be seen quite clearly here – not helped by the few doors that the modelmakers cut out for functionality. 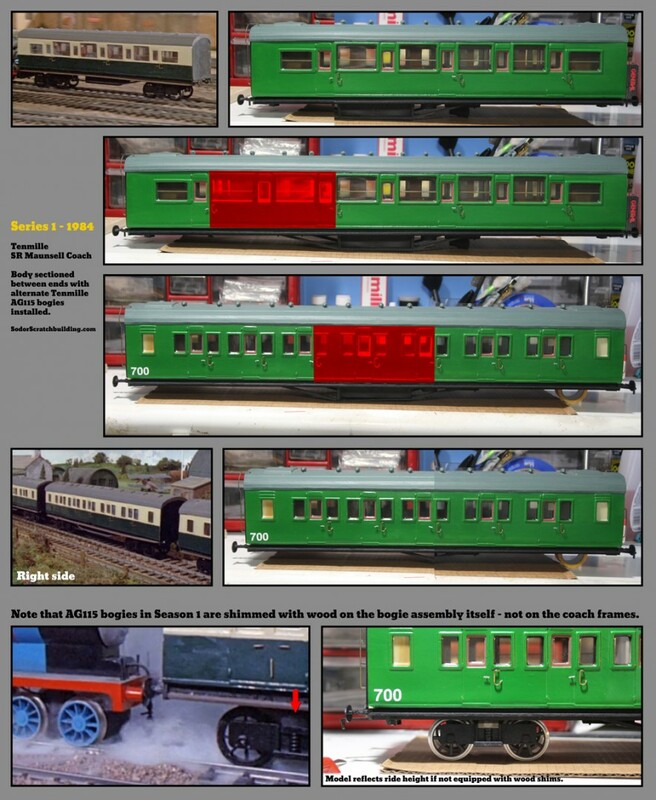 Series 2 deviated from these modifications by introducing mostly unmodified Tenmille coaches to the regular fleet (almost doing away entirely with the Series 1 coaches). 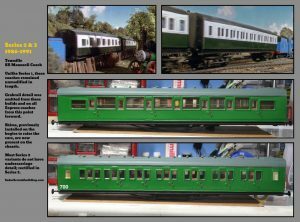 The effort put in the Series 1 coaches is in stark contrast to these speed builds, which omitted grabrail detail – something to continue throughout all further Tenmille-based Express coaches – and all undercarriage detail. 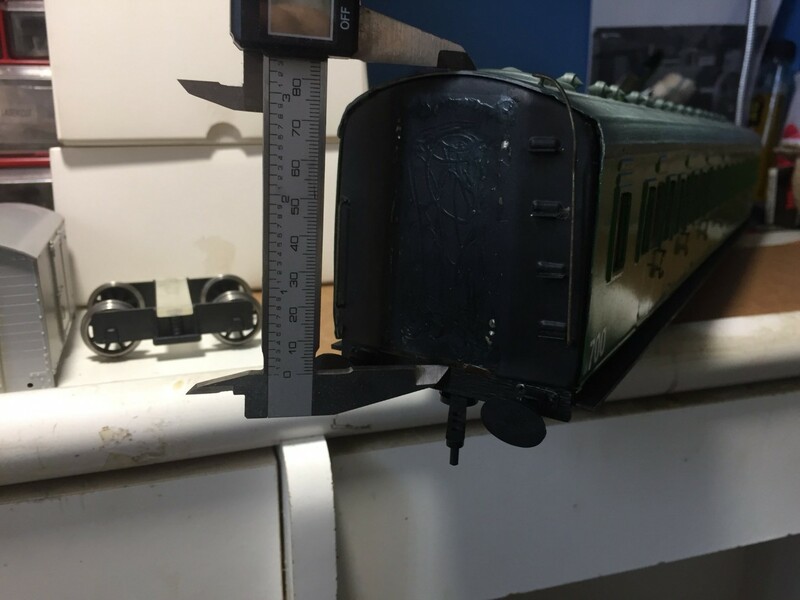 The wooden shims used to raise the coaches were now fitted onto the chassis (also wood), and the bogie itself reverted to the stock Tenmille piece. 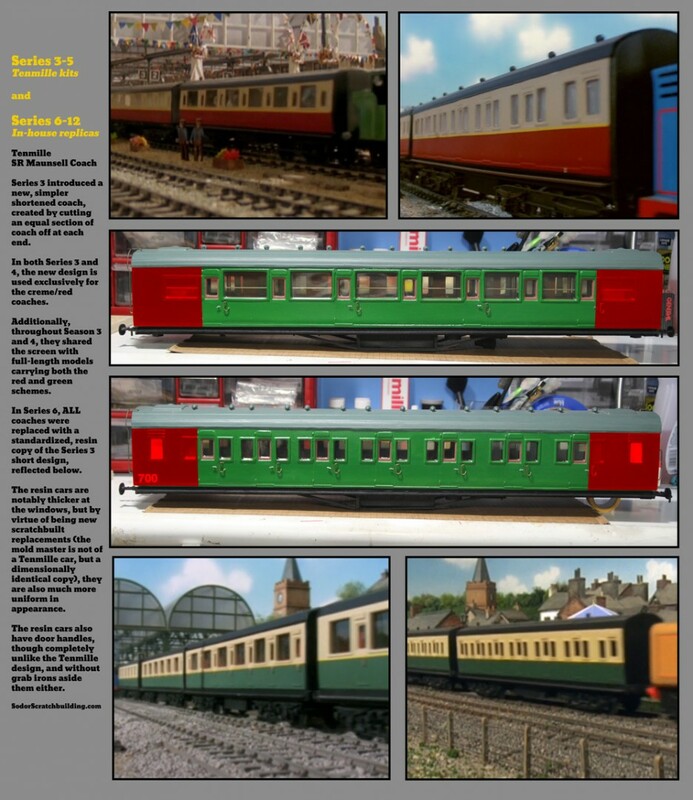 Series 3 shared two coach designs. The first was a literal continuation of the Series 2 design with the aforementioned missing undercarriage detail rectified. The second Series 3 coach returns to the ideas originally executed in Series 1 – a shorter coach for tighter curves and better use of set space. 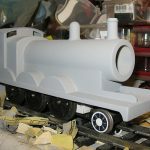 Unlike the S1 coaches, the S3 “shorties” were created by cutting an equal section off the ends of each car side; as opposed to the center cuts made in Series 1. In both Series 3 and 4, this new cut down design was used exclusively for red/creme coaches, though these “shorties” continued to shared the screen with full-length models carrying both the red and green liveries. 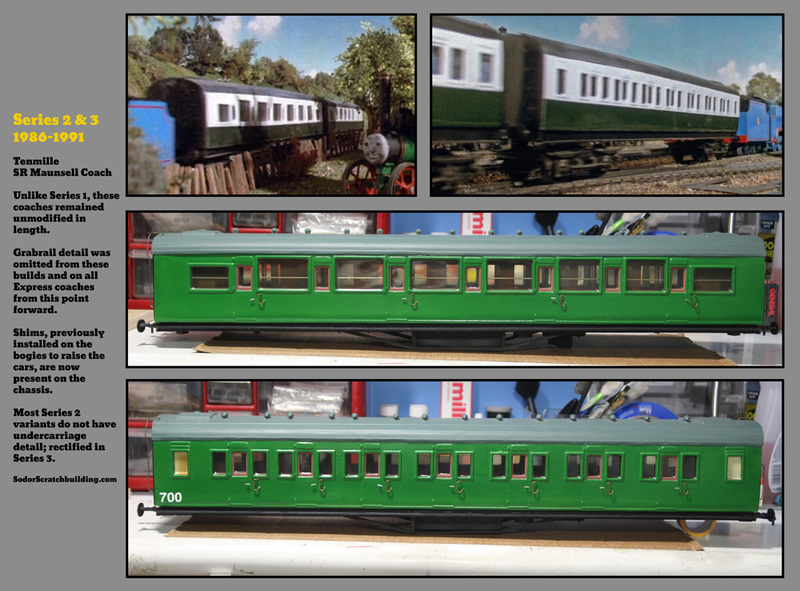 In Series 6, ALL Express coaches were replaced with a standardized, resin copy of the Series 3 short design. These replacements are not based off the Tenmille cars, but are molded off a dimensional similar, scratchbuilt copy. They are also more uniform in appearance given that the original sides aren’t fragile vaccuformed plastic, and the thicker resin is also notable at the window frames. These resin cars also have door handles, though these door handles are completely unlike the Tenmille design, and do not have grab irons aside the handles. 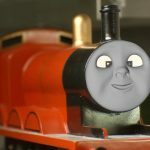 The Series 6 cars are the basis for the show’s current CGI mesh. The CGI cars differ only in that they have equidistant compartments and an abnormally narrow width (as of Season 21). 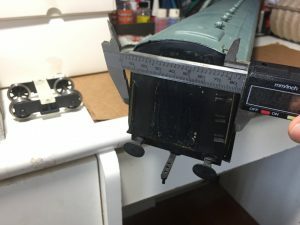 For the record, 82.8mm and 84mm are the proper respective width and height measurements for the original Tenmille cars. 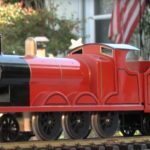 I’m really digging your recreation of the Sodor Express coaches, would it be possible to get a side shot from the left and right, as well as the front of them, I’m doing a 3D project for Train Simulation and I would love to model all three and a half variants. 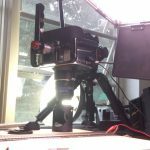 This could be arranged, though I believe there are side shots of all the variants already in this post. What would you need, specifically? I was looking for a parallel projection of the right, left front/backs of the coaches. I can get the length from some I found from uktrainsim. Thanks!!!!! Would you mind sharing the length of the Tenmille carriages (and the AG115 bogie if possible)? 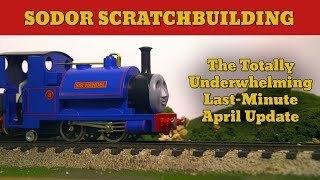 I would love to scratchbuild 00 gauge versions of these.